How Beeminder Paid for 14 Bikes. Due to retweets by Fatty and the WBR the post with the most views in the young history of this blog. My Blogging Workflow with Beeminder and Trello. I got some solid running in over the last four weeks with about 135km in 19 sessions, averaging 7km, with the longest distance back to 14.5km. I also managed to visit the gym for a couple of strength training sessions as well as one spinning session on the bike. For the next four weeks I’ll keep the weekly mileage at around 40km and will not increase the long run to beyond 15km. I’ll add some tempo elements and continue to work on form and strength. This time there is one item of note and it could have ended up as a blog post on its own. We had guests over at the 4th Sunday of Advent for some winter BBQ. With about 12 folks at the house, I decided to try a beef brisket (7kg, no less) for the first time ever. 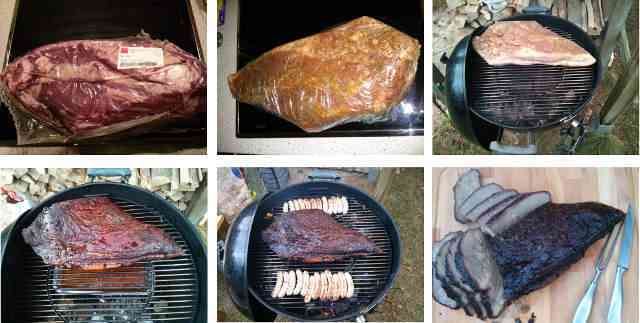 Top: as delivered, seasoned for the night, early morning on the grill. In true nerd nature, since this was going to be a long BBQ session, I wanted to throw together an Arduino-based temperature logger to monitor meat and grill heat. Not all parts arrived in time though, so no temperature logger was built this time. Now that I have all parts I’m sure I’ll blog about the project in the future. I just need to invite enough people for that huge amount of beef again. Oh, for the record, the brisket turned out really tasty! Lastly, a more or less uncommented link-dump of the past 28 days. With the holidays and such, this list is surprisingly short this time. I guess I haven’t been surfing the web a lot over Christmas and NYE. While I personally root for the San Diego Chargers, this is still a nice look behind the scenes of an NFL team’s travel logistics.